I'm so excited that I'm finally posting these pictures for you guys!! Bella requested a Star Wars theme for her birthday this year and I have to admit I was a little apprehensive. I am not familiar with the movies, like she is, but luckily I had my friend, Denise, to assist me. She also happens to be a huge Star Wars fan! The dessert/favor area was the main set up. We scaled this party down a bit from our usual party decor but I think the details we did incorporate made a big bang!! Storm trooper goodie bags: I used a storm trooper graphic and printed them out. I cut out the faces and used rubber cement to glue them to your typical white lunch bags. The backdrop is a twinkle light star wall. It's super easy to make. You can take a black foam board and use a drill bit to drill holes in the board for your lights to poke through. I secured the back with duct tape to make sure the lights stayed in place. Regular white Christmas lights would work. Vader, storm trooper, and ship cut outs were also provided by Everything But The Cake. In the hallway we tried creating a star wall with twinkle lights and a black table cloth but the photograph didn't do it justice. Initially I had a plan for a cake but poor planning didn't allow that to happen. Instead I whipped up these super easy cupcakes topped with a pink marshmallow storm trooper. I used a Wilton food marker to draw on the faces. 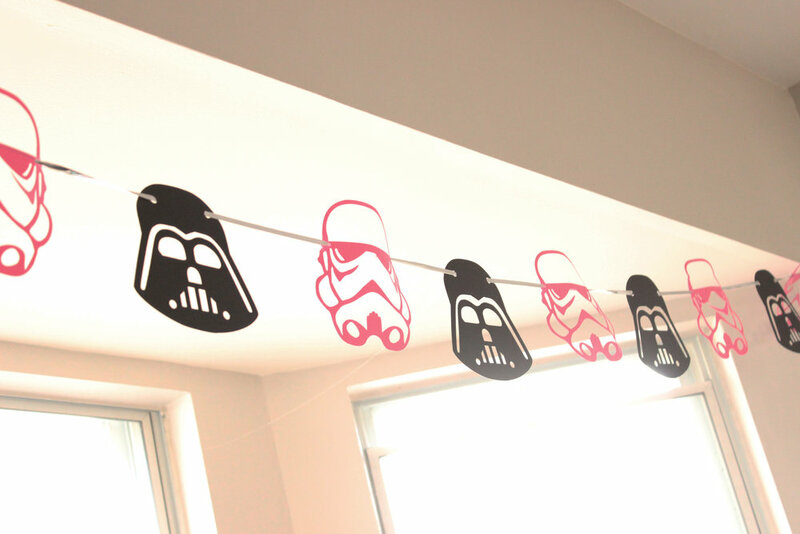 You can order your own custom Star Wars invites in our SHOP! What do you guys think? I think this would be super cute for a Girl Scout overnight with a Star Wars theme! 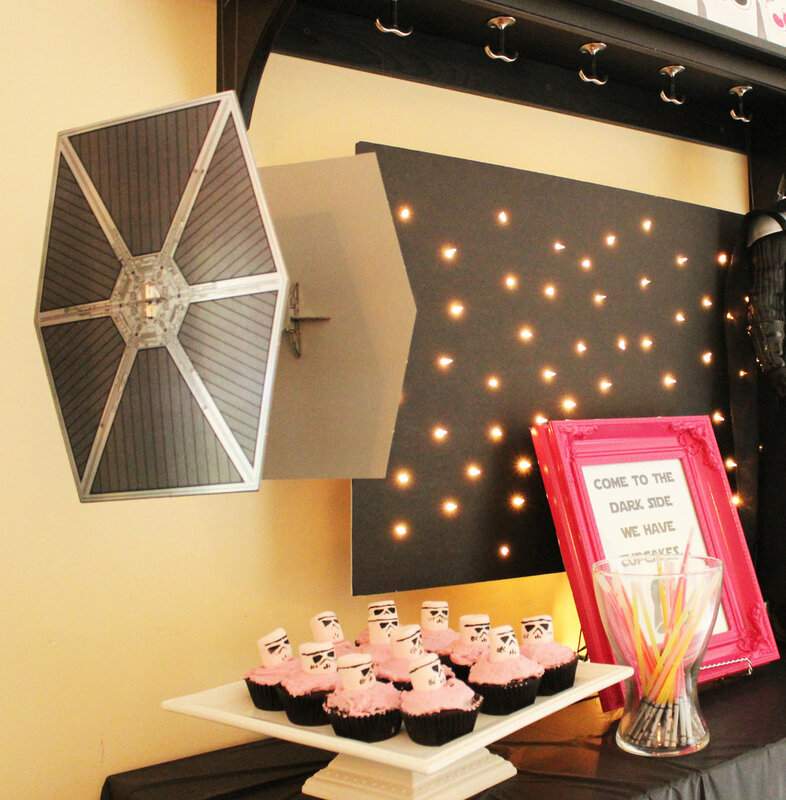 Posted on March 29, 2017 by Katie D. and filed under Celebrate, Raising Girls and tagged star wars printables invitations darth vader storm trooper girls birthday Celebrate party. Ryleigh's birthday party was last month. There has been so much going on in our house and I've been trying to organize everything with Girl Scouts that I didn't have an opportunity to post this yet! I figured I had to get it in before Christmas and New Year's. She has a undeniable love for Dinosaurs and when I asked what kind of party she wanted she specifically called for PINK Dinosaurs! We had custom printables designed by myself, a Dino Adoption, and a smoking lava cake! See more deets and get your free printables! Posted on December 21, 2015 by Katie D. and filed under Celebrate and tagged Celebrate pink dino girls birthday birthday cakes Birthday free printable. Today I'm really excited to share with you my latest party I have been planning. Ryleigh turns 4 and her party is next week. She has been in love with dinosaurs lately so I just had to use this as the theme. Here is the preview and a printable for you, including fill in invitations, dinosaur adoption certificate printable, and A7 envelope inserts! I hope you enjoy and check back for some more pictures of the final party! Posted on November 15, 2015 by Katie D. and filed under Celebrate and tagged Celebrate dino party pink dino girl parties might girl parties free printable. I'm really excited to share this super cheap, super easy Halloween craft that you can make with your Girl Scouts troops or just as decoration for around the house! I can't remember how I came about purchasing black tissue paper back in July, but thankfully I did and this idea popped into my head. I've been a little nutty, (with fall product..lol) using tissue paper for all of my designs, lately. Cut tissue into a 8in x 8in square. Make a 1 inch fold along one side. Using the accordion method, continue to fold back and forth 1 in. Use your scissors and cut a half circle out of each of the ends. Fold at the center and crunch up and flatten. Insert clothes pin in the center and fan out your tissue paper to look like bat wings. These would make cute napkin ring decorations or you can string the on some garland or fishing line! Happy Halloween planning!!! Posted on October 12, 2015 by Katie D. and filed under Celebrate, Create and tagged holidays halloween halloween decor Celebrate. I'm so excited to share with you today my weekend project and my latest obsession! This is seriously so easy to do and it makes the invitation feel like a million bucks. 1) Grab my free pdf A7 envelope liner template and print it out. 2) Cut out the template and lay it on top of the paper you wish to use as your liner. I would recommend a fairly thin paper, such as the decorative scrapbooking paper. 4) Insert liner into the envelope. Once the liner is inserted and evenly arranged, lift back the liner to separate the envelope and dab glue on the edges of the back side of the liner. 5) Allow the glue to dry before you insert the invitation to make sure there is not excess glue that will stick. And your done! Doesn't it make such a difference? These would look really special with thank you notes, too! Don't have an A7 envelope? Check back soon for more sizes and shapes. Thanks for following along! I'm in the process of creating some custom liners that you can just print and cut! Posted on September 1, 2015 by Katie D. and filed under Create, Celebrate and tagged invitations paper parties Celebrate. It's been almost a month since this precious girl turned 6. This was a hard birthday for this mama. She is my oldest and I couldn't help but reminisce of when I turned 6. It's the earliest birthday I can remember of my own. I look back to that day that I turned 6 thinking I was changed and different. Thinking that I was growing up and I started to feel much older. LOL at only 6 I had those feelings. Perhaps it was from this memory that this birthday for my little girl was a little tougher than the previous. The years are going by so fast and I'm just wanting to take a step back and enjoy the present. My sweetheart has been so in love with Hello Kitty for some time now and I was excited to decorate her party for what she loved so much! We bought her this cute dress from Target and paired it with a pair of black leggings and the Hello Kitty hat. You can't see it now, but there is a Kitty on that hat. I generally don't like to give out candy at a birthday party. Yes... I am one of those moms that prefers non-sugar party favors but the colors and the idea just seemed so much easier this year. The kids always get a kick out of it, too. So it's a winner! I found a Hello Kitty cake pan on clearance months ago from Joann Fabrics. I used a marshmallow fondant for the white frosting. For the eyes, whiskers, and bow I used black and red sparkle icing. For the nose, I rolled up some of the marshmallow fondant and used some leftover yellow food coloring to paint it on the nose. Bella really loved the cake!! I wish I could tell you where I saw this idea. Honestly, I found it years ago and it came to me when planning the party. I used the edible pens to draw the faces on the marshmallows. Denise also assisted in this department. She made me some custom food tents as well as some extra blank tents! Those are a few details for our Hello Kitty Party! What do ya think? Posted on April 20, 2015 by Katie De La and filed under Celebrate and tagged Birthday Celebrate Hello Kitty Party favors birthday cakes candy bar hello kitty fruit skewers hello kitty party party planning.